Tackling the kitchen remodel in our new / old house was daunting. I remember, standing in the old, historic family home, exactly this time last year, looking around the kitchen thinking to myself 'what the hell have I gotten myself into?' 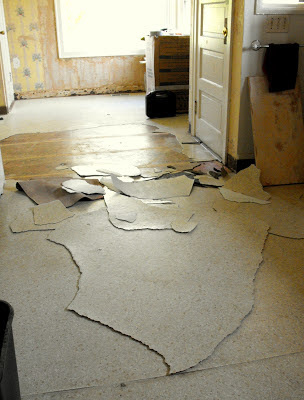 I stared at the ancient, chipped and broken counter top, the equally ancient and filthy 'layered' linoleum floor, peeling walls and cabinet surfaces and felt, well, overwhelmed. So, as was the motto with all the projects we undertook (and continue to undertake) in the economical restoration of this old family home, we rolled up those shirt sleeves, hunkered down and got to work. 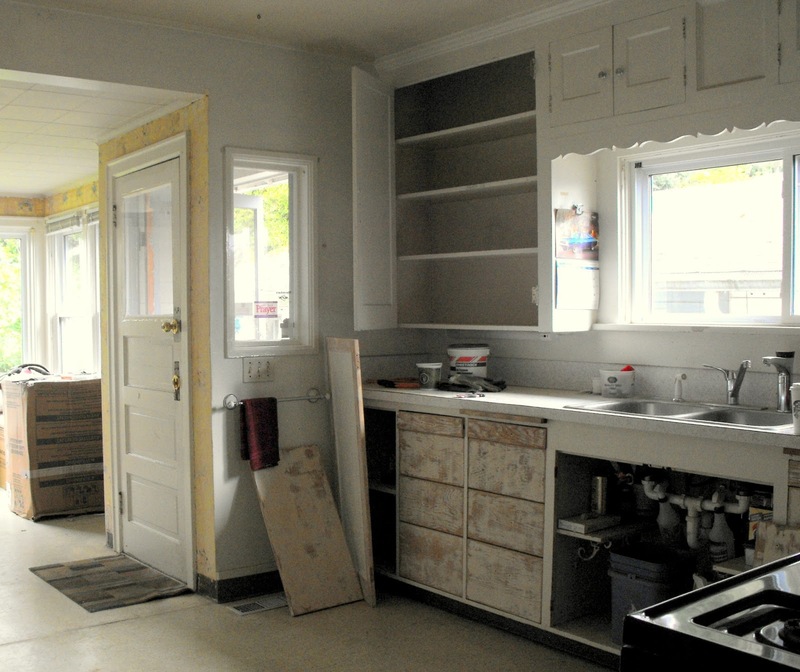 How do you keep a shoe string remodeling budget in tact while updating a very old kitchen? I'll tell you how we did it. #1) I bought used, matching appliances on Craigslist. Seriously. I knew the color and features I was after (for example, a gas stove). I looked daily for listings. I had time on my side. So, I waited. I researched makes and models and finally hit the jackpot. A builder was remodeling a home and switching out a set of newer appliances that were black (just what I wanted!) for stainless. The builder and I met, negotiated on price and I got my newer dishwasher, gas oven/stove and microwave for under $700. Yes, people. I researched what these appliances would have been new and saved at least $900. I still shake my head at the craziness of it. As a side note, the oven did need some new parts and with the labor and service it cost me $200. So, that brought my savings down to about $700. I think that is still awesome. #2) I carefully used my contractor. I used him for the pieces of work that I just did not have the know-how to DIY well. For example, counter top installation. I had him update the plumbing for the kitchen sink/disposal and plumb in a gas line for the gas stove. 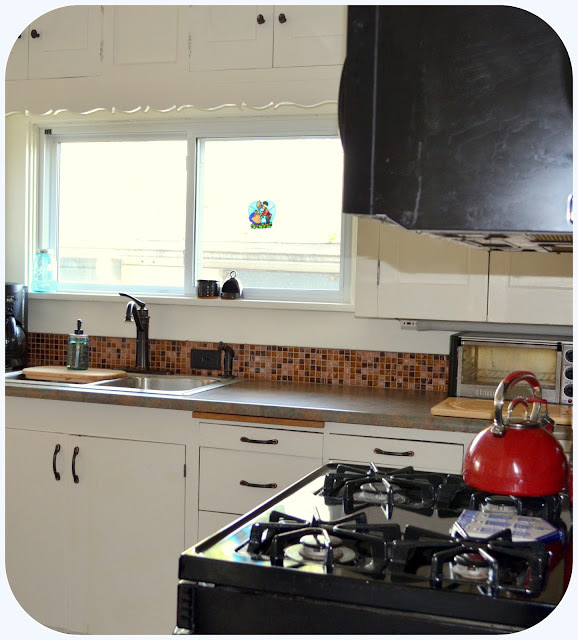 He also installed our tile back-splash and new kitchen sink. #3) We did the work. My husband and I sanded down the walls, repainted them and repainted the ceiling. My husband spend countless hours sanding down the kitchen cabinet doors, removing nearly 80 years of layered paint, and repainted them. #4) Sensible choices. I opted for a less glamorous, non-granite counter top. My kitchen is a working kitchen. A place of food production. I needed a material that would hold up to my less-than-graceful ways in the kitchen. So, Formica it was, in an updated, faux slate finish. It works for us and was about $1500 less than a granite counter top. 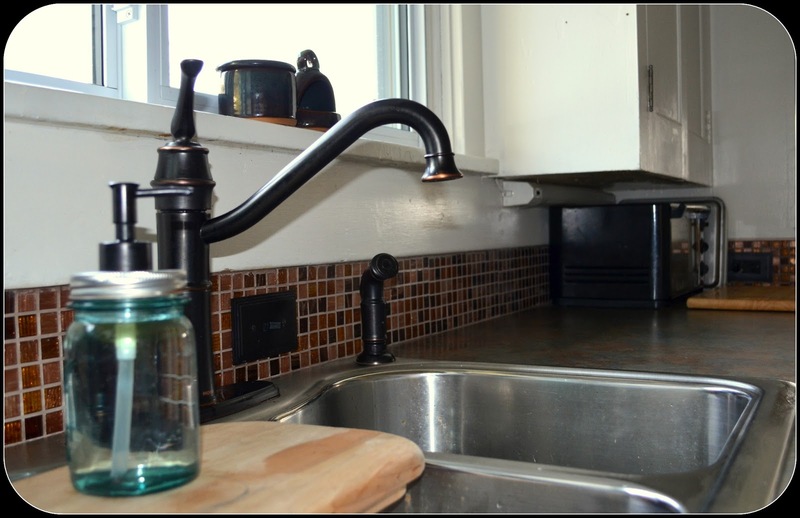 We also installed a new, stainless steel kitchen sink. 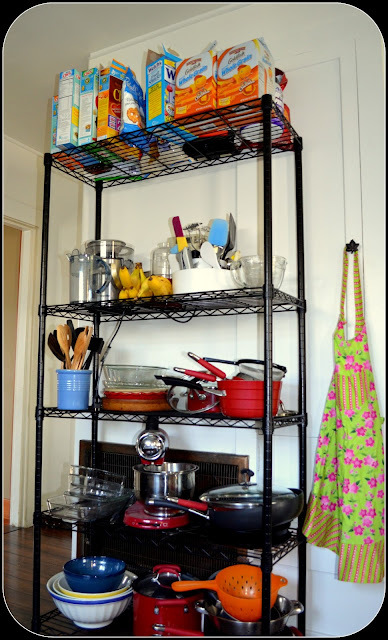 Granted, I was ogling over those fabulous, apron, farm-sinks, that are so en-vogue....but, practicality dictated that I remember how I had been using more and more cast iron cookware, and the thought of those pans clunking against the porcelain farm house sink, chipping and denting it, made me ill.
#5) Updating Fixtures. While the Art Deco look is really cool, it's just not my fave. I choose to replace all of the light switches, electrical outlet covers, lights and cabinet/drawer cabinets with a new, consistent look. 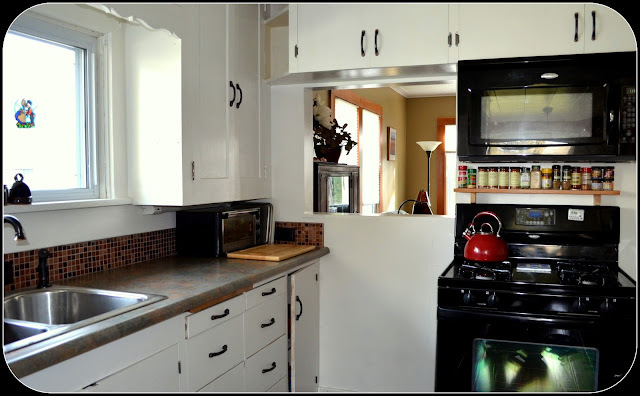 This allowed us to get away with keeping the old cabinets and to just spruce them up for a fraction of the dollars. Three layers of linoleum, with the final layer likely having asbestos in it and likely, glued with an asbestos based glue. It was the norm of that era. I was a wreck. I had our move-in looming and school was starting in a matter of weeks! My family needed to move in. 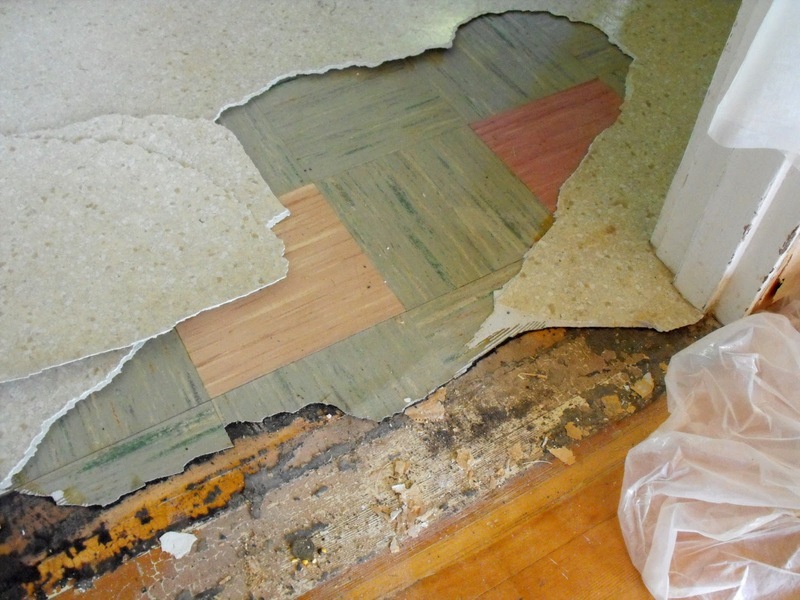 We clearly did not have the funds to pay someone to come in and rip out all those layers (3 to be exact) and either refinish the softwood floor underneath (which was our dream) or create a new base layer and put a floating floor on top. I was a mess. It was critical for the floor to be finished in order for us to move in. My dad came to the rescue. He rounded up a buddy of his, who was an expert in tile flooring installation. 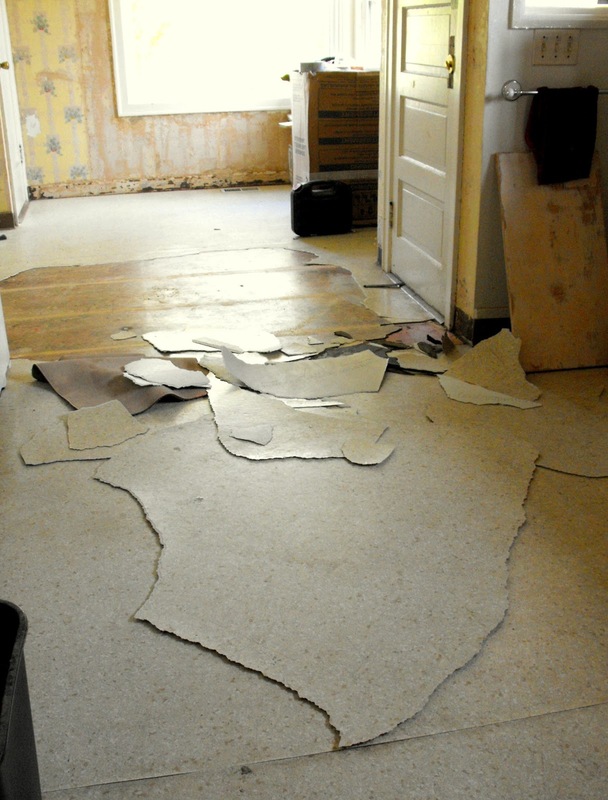 They ripped the first two layers of linoleum off and then applied some kind of leveling, liquid material and put down cement board. They created that 'base floor' we desperately needed in and saved our shrinking budget. By preserving the original kitchen cabinets, of which the bottom piece was actually built by my husbands great-grandfather, we saved ourselves over $20k. 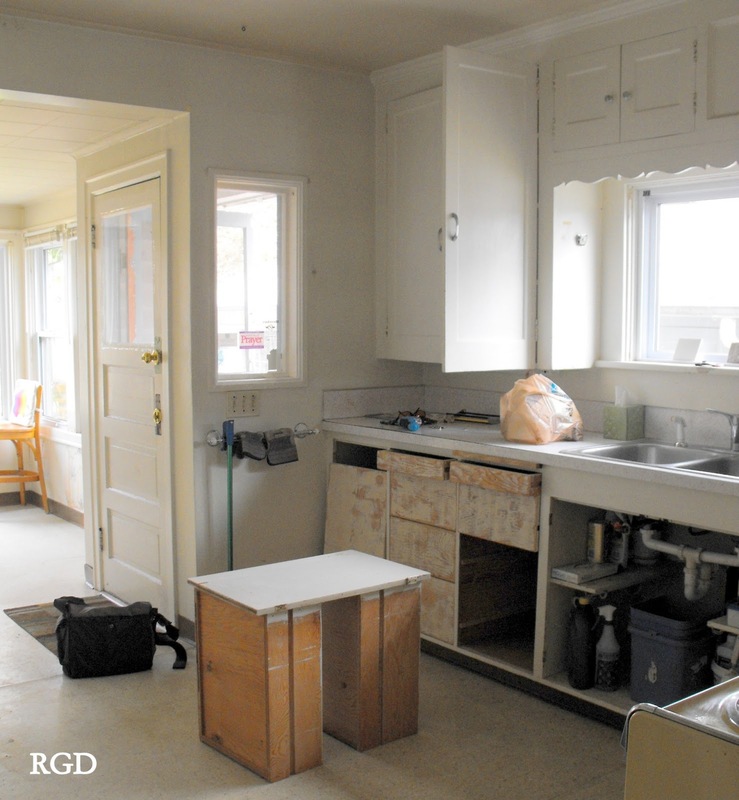 Cabinet replacement is the major expense of most kitchen remodels. I look at my kitchen now (where I spend an ample amount of time daily) and I'm pleased with our results. I feel we did a good job of combining the original elements of this old family home with some updated features and in the process have preserved the look and feel of the space while blending in some modern components. Mission accomplished. Coming up in the next installment, the new dining room. My wife and I always get a good laugh out of the DIY shows where they save 30k but then you find out they only spent 70k. It all looks very nice. Doing projects yourself always is rewarding and knowing when to call the expert is priceless. Great Job. Another thing to remember is that though it may not be the dream home yet, the people in it are much more important. I know you know this probably better than I do, but it helps keep those granite counter tops and that beautiful wood floor in focus. IG - It's true, I spent countless hours watching those home remodel shows. I did pick up good tips and tricks and got inspired by some of the renovations I saw but overall, nothing beat just digging in and getting your hands dirty. I am impressed, Jenni. It looks wonderful!! Way to go! Kudos to you on everything, the work you did yourselves, and the work you knew to ask for help with! Good for you for being patient and waiting till you saw what you wanted on craigslist. This is a beautiful, functional, family kitchen. My kitchen counter is formica too, but it works just fine. And I really love your new faucet! Thanks Alison, I think out of everything, I love that new faucet the most too! Really good ideas on saving money Jenni. My brother in law is an everything high end type of guy. Yet he comments time after time about how relaxed and cozy he finds our house. I too have memories of sanding and painting kitchen cupboards. I thought it would never end. But it did and I had years of pleasure from admiring how good they looked. Susan, I recently walked through the home of one of the 'high end' houses in our area. The home was sparse and left me feeling cold. I decided that my cozy little cottage is just perfect. I'll take cozy any day. It looks great - you really did well and fell on your feet with the bargains! If only! Now it's the outside of the house to paint and gardens to grow! Jenni, you have done a marvelous job...it's stunning...perfect, and practical. Good for you for deciding what was important to your family, not just the looks. And I loveeeeee that faucet. What an amazing transformation! I love those little tiles in your backsplash!!! Wow! It looks great! I love the black appliances. You should be really proud of how it turned out. Wonderful job, Jenni. I don't envy you the work but the results are fabulous. Your bragging rights are well-deserved. Having a lot of helping hands doing on a project like this makes life easy and cuts you down a few hundred dollars for workers, plus, it's a great family activity, right? I help in every possible way I can in every remodel that we have at home, it saves me a lot of money when you come to think of it. By the way, your new kitchen looks fabulous! I hope you exceed your budget for this kitchen. Wow! Your kitchen looks amazing!!! Way to go! Your kitchen sink area looks awesome. I find the faucet and sprayer unique. The design has a vintage look, which gives beauty to the whole area. Where did you buy it? The next time I decide to replace my faucet, I’d probably go for this kind of design as well.